Howard Hanna and HSA Home Warranty know that the purchase of a home is one of the biggest decisions most people will ever make and that it’s important to protect that investment with a home warranty. Anyone with a home warranty has the guarantee that should their home need a repair, their provider will take care of the hassle of finding the right contractor. 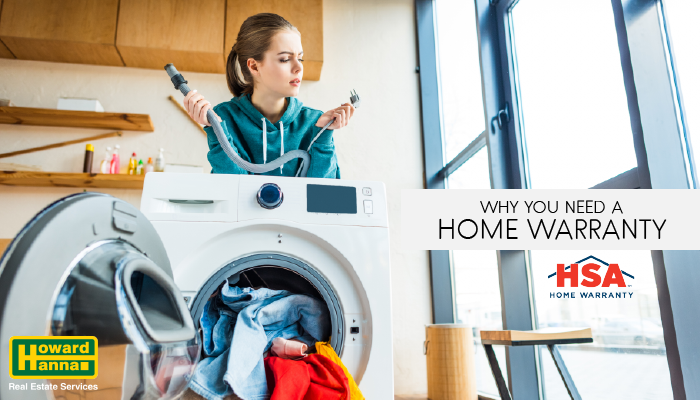 Regardless of whether it’s a dishwasher leaking on a Sunday night, or broken air conditioning on a hot day, the home warranty will cover it. Through a wide network of service providers, providers like HSA Home Warranty can get the problem addressed quickly. As a residential real estate leader and the fourth largest real estate company nationally, Howard Hanna connects you with providers like HSA to deliver both home buyers and sellers with the value and security that they demand from a home warranty. For more than 30 years, HSA Home Warranty has been providing comprehensive warranty plans and high-quality customer service. For home buyers, a home warranty protects from the high cost of unexpected failures by repairing or replacing covered items that break down due to normal wear and tear. Where homeowner’s insurance doesn’t apply, the home warranty fills in the coverage gaps. It helps to secure the best protection for both the home and budget. For the home seller, a home warranty provides protection during the listing period. This helps eliminate many out-of-pocket expenses that sellers can sometimes experience, helping cover the unexpected. This coverage of your home while it’s on the market allows you to concentrate on selling the home instead of worrying about repairs. It is a powerful marketing tool that helps you set your home apart, and if anything unforeseen happens after the closing, the buyer will turn to the home warranty company instead of you for help. HSA Home Warranty holders will enjoy peace of mind, reliable service, and protection of their homes with the HSA Service Guarantee, which protects Howard Hanna buyers and sellers. Using your HSA home warranty for just one service in a year could save hundreds of dollars in repair and replacement costs. Learn more about an HSA Home Warranty by visiting http://www.onlinehsa.com/.